We at, Singapore Incorporation Services Pte., Ltd., are involved in all ranges of immigration and work visa processing services, which are applicable for foreigner to visit and work in Singapore. With our years of experience in this field, we can assure you to get the genuine work permit for employment and business through legal means. Also, we do process the application of client’s immigration or work visa as soon as possible or in a given time frame. The foreigners, who aspire to work in Singapore, they need to apply for work visa before joining their jobs. Also, the companies in Singapore, which hire applicants from outside the country, they need to issue a valid work permit or visa for them too. The company does not follow the genuine process of hiring candidates from abroad then it will be prosecuted under the Manpower Act in Singapore. The companies in Singapore are recommended to issue work permits to the foreign candidates, who have complete eligibility and good skills for particular designations in their ventures. Also, they need to hire applicants, who come from reliable sources or authorized employment consultancies in Singapore only. Generally, the duration of work permit issued to any foreign candidate in Singapore is of 2 years. Also, the candidate needs to show his or her skill set to qualify the examination to get the job legally. Moreover, the salary of the candidate should be $2,000 or less. 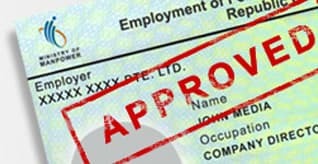 Give right assistance in case of rejection of work permit approval application. Why Need Employment Pass to Work in Singapore? The Employment Pass (EP) is applicable to be applied by entrepreneurs, business freaks, and job seekers, who want to work or incorporate a company in Singapore. It is necessary to have a legal employment pass or work visa to entrepreneurs, professionals and executives, who desire to work in Singapore. One needs to apply for term employment pass that is abbreviated as EP or E Pass. The applicants need to apply for the E Pass through MOM (Ministry of Manpower) in Singapore in a genuine way. When you will get E Pass, you will be able to stay in Singapore to do job or business for a specific period or till validity of employment pass. The candidate having vast experience in their profession or occupation, they are highly preferred to get the employment pass (EP) in Singapore soon. But make sure they have submitted proofs of relevant work experience to the MOM authority. Mostly employment passes have become preferred choice of entrepreneurs and businessmen, who want to incorporate new branches or offices in Singapore. Besides, the candidates having genuine employment offers and business plans, they are also being entertained to setup their ventures in the country through legal process. The minimum validity of employment pass in Singapore for applicants is 12 months. We at, Singapore Incorporation Services Pte., Ltd., are ready to assist the applicants, who wish to work and do business in Singapore. We enable our patrons to apply for the legal employment passes or work visa and will process their applications legally as per guidelines of Ministry of Manpower (MOM) in Singapore. Make sure, you are a managing director, foreign entrepreneur, or a local resident of Singapore and want to setup new business in the country or retain operations of business in the country. You are a local resident of Singapore and want to hire staff for your company from abroad then you need to apply for employment passes for the candidates in advance. If you have a job offer in Singapore, then your employer has to issue an employment pass on your behalf and manage its application process too. If you meet any of the above requirements, we are here to assist you for processing your employment pass application as soon as possible. Providing support in executing self assessment process with MOM. Right suggestions for pre-application filing process and gathering relevant information regarding same. Thus, we take pride in assisting our clients for all above things and will help them to process their employment pass applications with MOM in a legal way. One should have a fixed monthly salary package at least S$ 3,300 (from 1 January, 2017, the Singapore government has been increased salary package bracket from S$ 3,300 to S$ 3,600). Applicant should have relevant qualification for the post such as diploma or degree in specialized stream for which you have applied the job in Singapore. Have any professional or technical skills and qualification in the same field. Other special skills like good communication, writing skills, etc. Relevant work experience in the desired field. Job offer letter from employer. Applicant’s work profile, salary package, and having valid work pass or citizenship of Singapore. Applicant has job offer from reputed brand or company and any government organizations in Singapore. Moreover, the company’s record as well as paid capital should be good. Have good in-demand skills and relevant proofs to show for previous work experiences. Government approved technical certificates and other industries’ knowledge. Updated passport or Singapore work pass or student pass and other passes to stay in the country for company incorporation. 2 Highest qualification certificates of applicant. Well designed Resume and Proofs of previous work experience in the desired field. Completely and accurately filled application form with required document proofs. Note: If you are a married person, you need to submit above 1, 2, and 3 things for spouse. 2) Generally, the processing time of EP application is 1 week, but, in case you are filling for EP application manually, it may take at least 5 weeks. However, it is suggested to go for online form submission option like 3E Accounting. 3) In case, your EP application does not approve or get rejected in first assessment, then MOM may ask you for submitting more information like job offer letter, business plans, testimonials, contract proof, etc. The process will again take 5 weeks in the assessment. 4) When your EP application will get approved, you will be able to visit the Singapore to collect your work pass or your employer will have to send you soft copy for the same on your email ID. You are requested to accept your work permit within 6 months of its issued date without fail. All in all, the whole process of Employment Pass Application process will be completed in 1 week to 3 months time. So, you need to have to wait till that time. Note: You are not eligible to stay in Singapore during process of EP or applying for the same. There are three categories of employment passes have been mentioned below such as P1, P2 and Q1. Meet the desired qualifications and certificates for the relevant post. The experienced candidates should have relevant salary package that should justify work experience of them too. So, whatever EP pass you want to apply, you need to qualify eligibility for the same without fail. We at, Singapore Incorporation Services, are always ready to assist the applicants and entrepreneurs to apply for desired employment passes in a legal way and will also help in documentation works, form filling, application process, once you will meet all the requirements successfully. We at, Singapore Incorporation Services Pte., Ltd., can help applicants for applying and submitting their employment pass applications to the Ministry of Manpower (MOM) in Singapore through electronic mode. So, you can keep track progress of application process and can expect for intended outcome soon. The time taken in the processing of employment application can be between 1 to 15 days. Once you will get the In-principle approval notice, we will do your favor to collect your work pass or EP. Your application of employment pass will be completed, once your company’s incorporation process will be done. You do not need to be physically present in Singapore for processing of EP. Add other required documents as asked in the approval letter. Note: You should get the medical examination clearance certificate or report from any recognized medical clinic or hospital in your country or in Singapore. In the country, you will also find many approved medical clinics, which can do the best medical examination of whole body and can give accurate medical approval certificate or report within a day. Are you willing to visit in Singapore for business? You need to apply for entry visa in Singapore first. If you already have IPA letter, then it will surely include a single trip entry visa in it. If you do have the same, we can take the next step for you. We at, Singapore Incorporation Services, will make an appointment with Ministry of Manpower (MOM) on your behalf for having finger print of yours and face to face interaction too. Once you will get completed all the formalities, your pass will get ready within four working days. You can collect your employment pass at Ministry of Manpower (MOM) directly or get it collected through Margin wheeler on your behalf. After renewing EP— up to 3 years. Not completing eligibility for EP pass in terms of complete documents, qualification, valid visa, etc. Moreover, you can have less work experience, non residential of Singapore or do not have work pass or entry pass, and so on. If you encounter with same situation and your EP has been rejected, you should not be late to contact us. We will assist you in this matter and will do the needful in defense of your EP application to file it once again on your behalf. We will personally involve in the matter to find out valid reasons of rejection of EP and will work on the same. The MOM has suggested all above reasons to cancel the EP of an applicant. We will also address the same and will complete all requirements as well as other required documents by Ministry of Manpower, if any. Thus, will keep track everything to make your employment pass application process smoother once again and finally will turn it in your favor. Note: It will again take 3 weeks to process an appeal of EP, which may also depend upon complexity of the matter. Note: We also entertain our patrons to give a free service of filing an appeal in case of EP rejection at first time. In case, you are changing your employer or switching job in Singapore, you need to apply for renewing your EP pass again. You do not need to cancel your previous pass before applying new one. The Ministry of Manpower (MOM) in Singapore will issue a new EP pass after following its standard procedure of checking applicant’s work experience, qualification, employer’s status, salary package of applicant, etc. Once all the things will be found genuine, then MOM will approve the EP application to issue new employment pass to you. But, your old pass will be canceled by the MOM too. For renewing your employment pass, you need to apply for the same with MOM in advance. Once you apply for the same, then Ministry of Manpower (MOM) will issue an Employment Pass Renewal Form to your current employer’s address two months before expiring your previous EP. Once your details of EP will get verified and approved by MOM, your employer will receive a notification of issuing a new EP is ready at Ministry of Manpower that you should collect on time. The EP pass holders, whose passes expired on or after 1 January 2012 due to some changes, MOM will provide them with one-off renewal of EP up to 2 years as per previous framework. The applicants applying for employment pass first time or renewing the old one before or after 1 January 2012, they all will be treated equally and will be provided with same one-off renewal form by MOM. The applications after 1 January 2012 will be treated as per current work pass norms as well. This personalized employment pass or visa is designed for foreigners of middle and senior level, who are willing to work or already employed in Singapore. The applicants having PEP passes will be applicable to stay in Singapore for up to 6 months. During this period, the job seekers can look for new employment opportunities too. Moreover, the foreigners having good experience in their work profiles, they can apply for PEP visa without securing their first jobs in Singapore. The personalized employment pass has validity up to 3 years. During this period, the pass holder is free to search new jobs without securing first job. The personalized employment pass holders have flexibility not to apply for renewal of this pass or visa every time when go to change the job. The personalized employment pass holder is free to apply for jobs in any sector or industry in Singapore. The PEP pass holders are allowed to stay in Singapore for 6 months. However, they are free to applying for new job opportunities in the country during same period without any legal obligation. The personalized employment pass is a kind of self sponsored work visa and one does not need aid of any sponsor in Singapore to apply for the same visa. Thus, this PEP visa is a good option for those applicants, who are willing to work in Singapore and visit the country to search the employment too. In case of rejection of PEP application, we will file for 2 appeals at least within 3 months of form rejection. Thus, we will provide about few benefits to the applicants for applying personalized employment pass in Singapore for applicants who are seeking for employment in the country. Scanned copies of all educational qualification details. Scanned copies of valid passport’s important pages. Scanned copies of salary slips of last 3 months. Scanned copies of any bond or contract and job offer latter. 2) Check filled application form once and submit it MOM for processing that will take 5 weeks. 3) For approval, an In-Principle approval letter will be mailed to the applicant’s Singapore address. 4) After approval of application, MOM will issue your PEP visa that you can collect by visiting Singapore. Note: PEP pass holder is not applicable to setup own business in Singapore. You are allowed only to work for a company in which you are not any shareholder or owner of the firm. What is Skill Pass (S Pass) in Singapore? Skill Pass or S Pass is a skill visa designed for mid- level skilled workers working at companies in Singapore. The application of S Pass will be processed for applicant on the basis of certain parameters such as candidate’s education or qualification, job type, skills, and relevant work experience. More will be impressive features of all such requirements, more will be chances to get S Pass in Singapore easily. There can be numbers of S Pass holders in a Singapore Company, who will be capped under the 25% quota or reservation of total number of employees in the organization. We at, Singapore Company Incorporation Pte., Ltd. are committed to provide complete assistance to the employers in Singapore, who are looking for foreign staff for their organizations. Probably, we are dedicated to serve the newly registered or setup companies in Singapore, which are looking for new staff in Singapore from overseas. We bring utmost reliability and sincerity in finding S Pass holder employees for the employers in Singapore through legal process. What is the Validity of S Pass in Singapore? Generally, the validity of S Pass in Singapore is up to 1 or 2 years. Once completing the time period, you need to renew the pass again to retain your services in the company or stay employed in the country. The process of renewal of S Pass may be affected with current norms of the higher authority. However, the applicant needs to follow up the prevailing norms for renewing the S Pass in Singapore wisely. If you are an S Pass holder in Singapore and have a fixed monthly income at least S$ 2,800, you can also apply for Dependant’s Pass or long term visit visa for your family members too. If you are an S Pass holder, you are eligible to apply for Singapore Permanent Residency (SPR) pass as well. Generally, there is no waiting period, but you are advised to wait for three years for applying permanent residency pass in Singapore. The applicant should have good qualification or hold a degree or diploma, or any technical specialty. Good skills of any works along with relevant experience of many years in the same. All applications of S Passes will be processed as per the current norms of approved authority. Flexibility of filing unlimited appeals in case of rejection of S Pass. Note: Our charges for S Pass services are only at S$ 680 per applicant! So, if you have skills and want to do job in Singapore, you should apply for your S Pass through us and visit the country for employment easily. What is EntrePass in Singapore? The EntrePass is known as Entrepreneurs pass, which is designed for entrepreneurs, who wish to do business in Singapore and register company for the same. It is a good option for skilled business freaks and R&D enterprises seeking to show their presence in Singapore and want to grow their ventures in the country too. If you are a skilled entrepreneur and want to apply for EntrePass in Singapore, but get failed for the same due to less qualification, you do not need to be worried. If you still have skills and creative business ideas along with vital experience, you can qualify for the EntrePass requirement in Singapore easily. The process of EntrePass application is quite complex than other Employment Passes in Singapore. Moreover, it is necessary that applicant should have a minimum paid capital amount up to S$ 50,000. We at, Singapore Incorporation Services Pte., Ltd, are ready to assist entrepreneurs around the world, who are seeking to incorporate new companies in Singapore and want to expand their skills as well as business at global level. We help those entrepreneurs in getting EntrePass through legal means and accomplish their business goals easily. Your new company should include at least two local employees (four from second year forward). The company should have to show total local business spending (TBS) of $100,000 ($150,000 from second year forward) over the past 12 months. You should have details of latest audited accounts to show as well. Have central Provident Fund Statements for the employees. Provide details of highest educational qualification of employees. Should have corporate bank statements to show. Details of company’s registration done with ACRA in Singapore. Have reference letters from customers. Proofs of recent invoices raised by customers and contract details with them. Thus, above are some valid requirements that an entrepreneur needs to qualify or submit details as asked for incorporation of company in Singapore and to renew EntrePass for next tenure. Prior advising for applying EntrePass application and gathering relevant information for the same. Arranging required documents for applying EntrePass application process. Tracking progress of EntrePass application under the process. Gathering necessary information about process and require from MOM director. Flexibility of filing unlimited appeals in case of rejection of EntrePass. Make sure the entrepreneur has visible and concrete business plans. The applicant should have enough amounts to spend willing up to S$ 100,000 in the first 12 months of the business setup. Do ensure that applicant is going to hire at least 2 local employees or Singaporeans in the first year of the venture. Ø The company starts receiving capital or fund from recognized third party funding company in Singapore. Ø The applicant should have a proprietary or licensed Intellectual Property (IP) recognized any authorized national IP institution in Singapore. Ø Should have alliance with a research institute that should be recognized by agency of Science, Technology, and Research or any local tertiary institution in the country. Ø Make sure the incubatee is at a recognized incubator supported by SPRING in Singapore or National Research Foundation (NRF). Ø Get the support of Singapore Government Agency. Submit details of date of company’s incorporation, registration number, and statements of shareholding in the company. If you get failed in submitting all above proofs, it will result in cancellation of the EntrePass. What are Company Setup Requirements? There should be one shareholder and one owner of the company at least. Make sure the owner of company is at least 18 years of age or more. He should be a Singaporean or genuine permanent residency pass to stay in the country for company’s incorporation. Submit local registered address of company. You should register a private limited company having minimum paid-capital up to S$ 50,000. The owner or shareholder should own at least 30% to 100% share of the company. Submit a 10 pages business plan detail that should include objective and full-fledged business blue print. Should have brilliant track record in business operation or management and have unique business idea too. What are Procedures of EntrePass Application? Submit the EntrePass Application form to us. Pay for EntrePass application process fee up to S$2,000 to us. Once you will clear the payment and get the receipt, your business plan will be prepared within 1 or 2 weeks based upon the business information provided by your end. We will make ready all required documents proofs at our end, you just require signing them only. We will directly contact the MOM director regarding processing of EntrePass and will handle them as well. It will take less than 1 working day. The time taken for EntprePass application processing will be taken 4 to 6 days weeks from date of submission of form to MOM. Banker’s guarantee is required for approval of EntrePass for amount S$3,000. We will setup your company once your EntrePass application will get approved by MOM. Download Form 8 or Singapore EntrePass Application Form from website of Ministry of Manpower (MOM). Submit press releases, brochures, and other collateral of previous or existing business in Singapore. A fully planned or drafted business plan of 10 pages or more. You can also download EntrePass business plan form. What is the key requirement of EntrePass Application? The key requirement for processing of EntrePass application is the concrete business plan of 10 pages that should include full-fledged details of how to achieve business goal successfully under the stipulated time frame and as per standard norms of Ministry of Manpower (MOM) in Singapore. Make sure, your business plan turns into the execution within one year period and should standout well to accomplish requirements of employing at least minimum numbers of employees in-house and achieve specified business goal as soon as possible. Note: Your application for Singapore EntrePass should be submitted within 6 months of company’s incorporation process to be done. Otherwise, you can also apply for EntrePass in advance. Once your EntrePass application will get approved by MOM, you will be applicable to setup a company in Singapore as a single director or owner of the firm. This should be done within 1 month from the date of EP approval for sure. Dependent Pass is the relocation pass issued to the selected family member of the applicant, who is already employed in Singapore and must be an S Pass, Employment Pass, EntrePass or Personalized Employment Pass (PEP) holder. To qualify for the dependent pass, it is necessary that the employed candidate or visa holder should have monthly salary up to S$ 5,000. However, the status of the applicant’s work visa is based upon the validity of work visa of him. We at, Singapore Incorporation Services Pte., Ltd., can serve you with reliable and authorized Dependent Pass services that will be fully governed as per norms of higher authority in Singapore. We enable applicants to get the dependent pass for spouse and children, but, make sure the candidate is already an S Pass holder or has Employment Pass (EP) to work in Singapore. The Dependent Pass (DP) enables the work visa holders to transfer their family members immediately in Singapore. This pass allows spouse and children (below 21 years) of work visa holder to visit the Singapore easily. Moreover, you can file for separate DP for each eligible family member too. Pre-application of Dependent Pass and arranging necessary information for the same. Filing of Dependant’s Pass application. Tracking progress of depend pass application under the process. Liaising with MOM directly to collect information for DP requirements. Arranging issuance of Dependant’s Pass upon In-Principle approval. Applying for several appeals in case of rejection of DP application process. Our DEPENDENT’S Pass Services are available: -Only at $S 680 per Applicant! 2) DP For Children— Birth Certificate & PassportNote: In case, your child is going to Singapore for study, you can approach to the school directly in the country and the school will have to apply for student pass in Singapore for your child. There is no Dependant’s pass is required or not to apply for the same. There is not any English document is required for an official English transaction. We at, Singapore Incorporation Services Pte. Ltd., offer Singapore Letter of Consent application service, which tends to provide with assistance to the employers seeking for LOC for eligible Dependant’s Pass holders, or an LTVP or LTVP+ work visa holders got married to any Singaporean or have permanent resident pass. The Letter of Content is applicable for eligible applicants or LTVP/ LTVP + work visa holders, who got married with Singaporean or already have permanent residency pass. Your employer or employment agent can submit for Letter of Consent application. The applicant can start working once the employer will receive the LOC. The applicant should have a Dependant Pass that should be valid for at least three months. We will process the LOC application online that generally takes 1 week time. For manual submission of application it will take approximately 4 to 6 weeks. Pre-application information and arranging necessary information for Singapore Letter of Consent. Filing for Letter of Consent Application. Keep monitoring progress of Letter of Consent Application under process. Direct interaction with MOM officer in-charge for further information for LOC requirement. Giving response to MOM officer’s request for any additional information related with LOC application process. Arranging issuance of Letter of Consent upon In-Principle approval. Applying for unlimited appeals for rejection of LOC Application. Thus, we will do the needful for making your LOC application process successful and get your LOC approval done as per legal norms of MOM in Singapore within time.